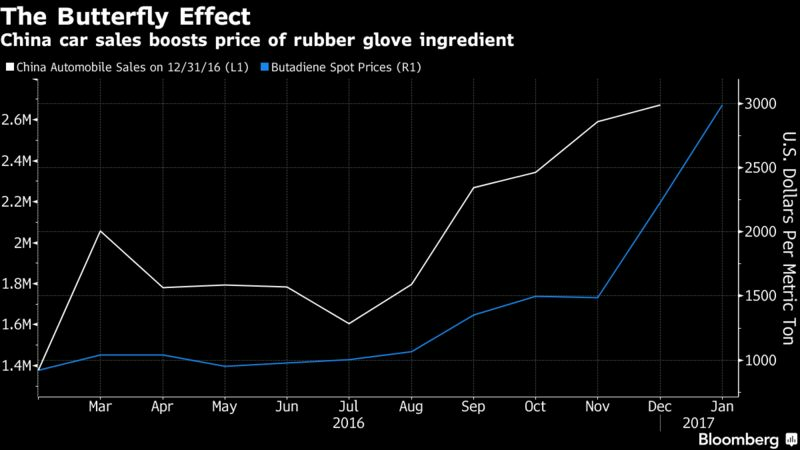 Rubber glove makers’ raw material costs jumped 45% since Sept.
Consumers across the globe donning gloves to do the dishes may soon feel the heat from rubber being burned on China’s roads. Surging car sales in China in the last few months have more than doubled the price of a little-known chemical called butadiene. The colorless gas, used for making synthetic rubber, has soared in tandem with rising tire demand, increasing raw material costs at some of the world’s largest rubber-glove makers. And now they warn the price increase will be passed to you. The butterfly effect shows how the footprint left by China’s burgeoning middle class is influencing the price of everything from steel to palm oil. And while rubber’s price surge can’t all be blamed on China -- floods in Thailand have stoked concern about supplies of natural rubber -- the majority of butadiene is estimated to be used in the automobile industry. China’s car sales posted a 26-year record-breaking streak in 2016, with 23.9 million passenger vehicles sold last year, fueled by a cut in a levy benefiting a large swathe of the industry. Meanwhile flash floods in Thailand have reduced rubber output estimates by about 7.6 percent for this year, the Bangkok-based International Rubber Consortium said. Those factors have lifted raw material costs for the glove makers by as much as 45 percent from September, an industry group in Malaysia, which produces more than half of the world’s rubber gloves, said on Jan. 17. Butadiene benchmarked in northeast Asia has surged 117 percent since the start of November to $2,990 a metric ton on Jan. 20. Rubber futures in Tokyo have surged more than 90 percent since the beginning of October. Top Glove Corp., which commands a quarter of the world’s glove market, slid as much as 1.4 percent to 5.13 ringgit in Kuala Lumpur on Friday, while Comfort Glove Berhad fell as much as 0.7 percent. Tiremaker Bridgestone Corp. gained as much as 3.2 percent in Tokyo. For glove makers, raising the cost of its products has become an inescapable reality. 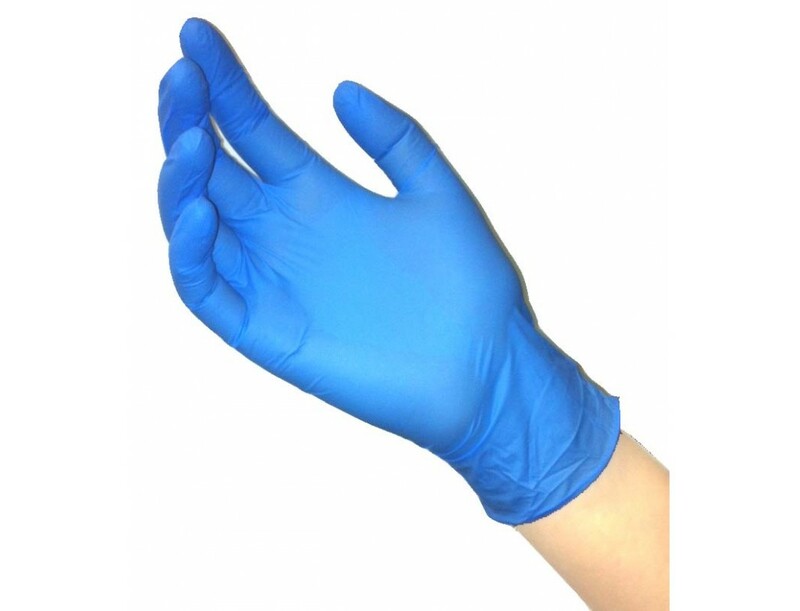 Nitrile latex producers are “being directly pressured and in turn, the cost is being passed on to the glove manufacturers, and who, in turn, have to pass the rising cost to the buyers and consumers,” said Denis Low, president of the Malaysian Rubber Glove Manufacturers Association. The price of gloves will have to increase by about 10 to 12 percent, he said. Butadiene constitutes about 70 percent of total nitrile latex costs. “It is a vicious cycle but that is the price that one has to pay to keep the latex producers from going under,” he said.